Let me get to the point straight. Its not a secret anymore. They can hear anything they want, read everything your write or read. Our government agencies spying on everybody's everything. It seems that there's almost no way to hide yourself. Recently the Washington Post reported that the National Security Agency(NSA) tracks the locations of nearly 5 billion cellphones every day overseas, including those belonging to Americans abroad. Now more than ever, people are looking for ways to make sure that their personal communications are kept away from the prying eyes of the government. But in the smartphone era combining with always on GPS and internet its almost impossible to hide yourself from everything you are going everyday. But actually today i found out there's a way out of it. It may not cover everything you are doing but it can do something atleast. A new free app called CoverMe, which is available for Android and iPhone, can do just that. 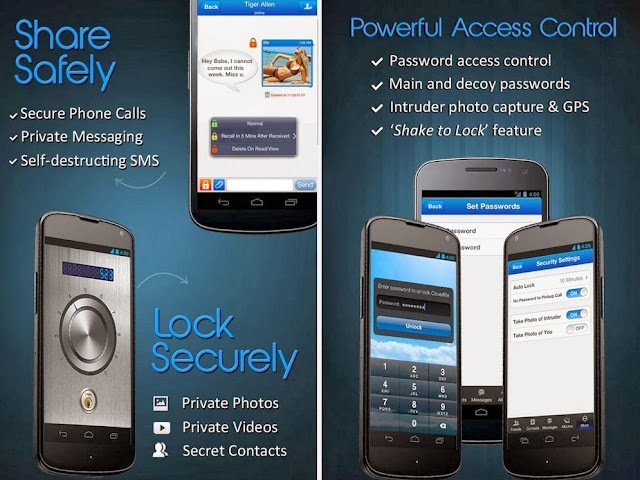 With military-grade encryption, CoverMe, delivers a safe and easy way of sharing private messages, phone calls, sensitive documents, photos, and videos so that users can rest assured that their private personal and professional content will remain private. To date, more than 500,000 people have downloaded the app—illustrating just how pervasive this problem has become. In addition to secure content sharing, CoverMe is equipped with an impenetrable vault to protect personal contacts, call logs, messages, documents, notes, diary, passwords, photos, and videos from prying eyes and in case a device is lost.